You won’t find stick figures and hop scotch drawn in chalk at Forsyth Park this weekend, but bright detailed scenes drawn by students at the Savannah College of Art and Design for the 34th Annual Sidewalk Arts Festival, one of the most popular events in Savannah during the spring. Photo by John McKinnon, courtesy of SCAD. 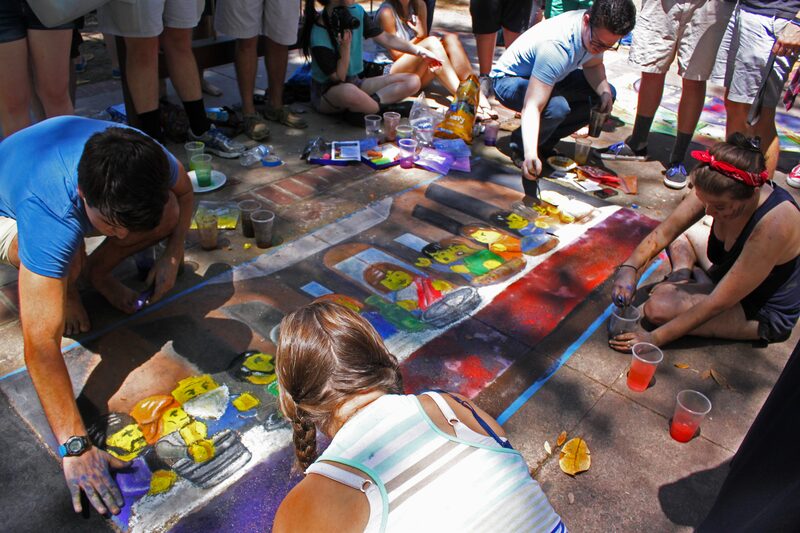 Every year, students team up and draw everything from three-dimensional people and animals, to abstract pieces and renditions of popular paintings on the sidewalk in Forsyth Park. But they don’t just put the chalk to the concrete, some students crush the chalk, combine it with water and make paint to create a magnificent scene or fun illustration. The fun kicks off at 10 a.m. and lasts until 4 p.m., when the winners are announced. Awards are given for everything from best of show to best aquatic creation by Grey’s Reef, who organizes the annual Ocean Film Festival, with first and second place prizes for individual SCAD students and alumni, as well as SCAD groups. But SCAD students aren’t the only ones encouraged to participate. High school students can also join in on the fun and compete for first, second or third place and receive gift cards to shopSCAD, one of the great shops on Bull Street. The fun isn’t limited to drawing at the festival. In addition from all of the cool galleries and cafes to check out around Forsyth Park, there will also be a variety of different vendors at the festival. 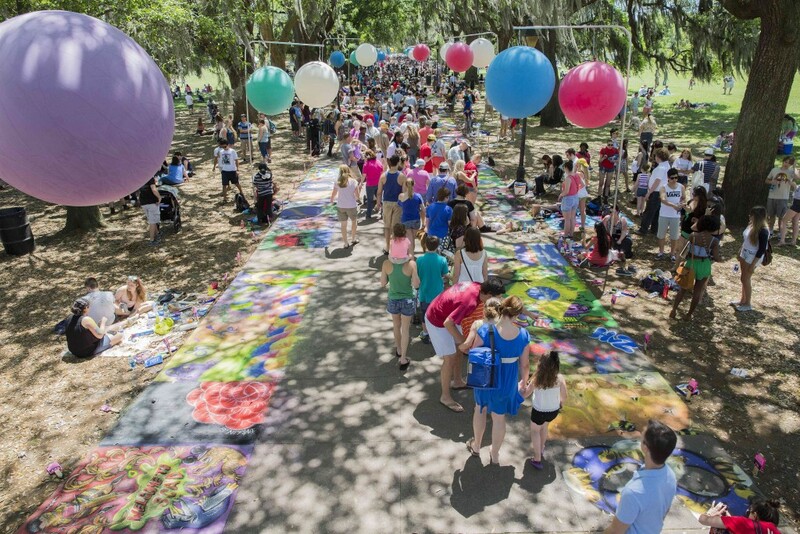 In addition to all of the cool galleries and cafes to check out around Forsyth Park, there will also be a variety of different vendors at the festival with food, international offerings and live music throughout the day, as well as a new form of art to check out, called tableaux vivants. In this new addition, guests can watch actors and models depict different scenes while remaining silent and motionless. 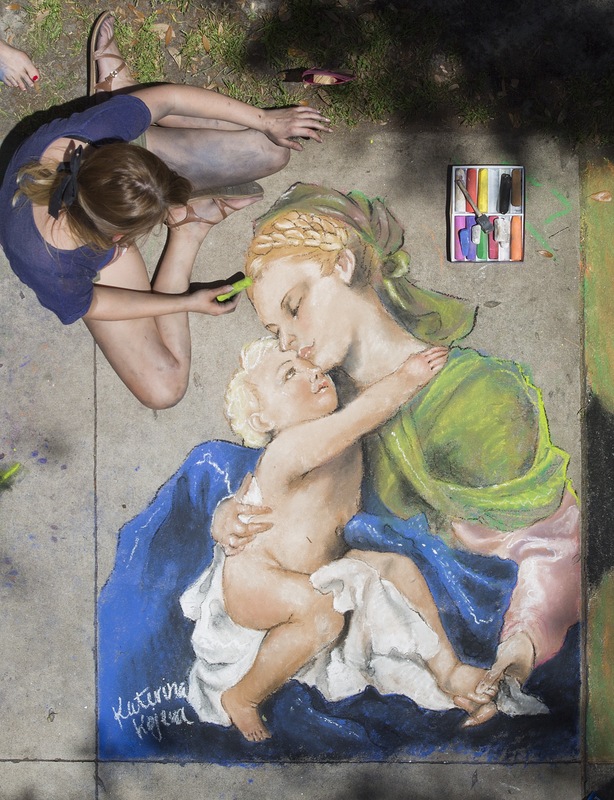 “Just as Sidewalk Arts Festival brings art out of the gallery and into community spaces this collaboration across multiple disciplines will literally bring classical works of art to life,” said Jaquillard. These “living pictures” will be staged North of the Forsyth Park bandshell with a depiction of the original artwork. An emphasis will be placed on staging, pose, costume, make-up, lighting and facial expression, all of which was put together by the SCAD staff, faculty and students. “We are very excited about this new addition,” said Jaquillard. And if you want to do a little exploring around Forsyth Park, there are some great galleries and shops, as well as some of the best cafes in the whole downtown area: Back in the Day Bakery and Foxy Loxy. 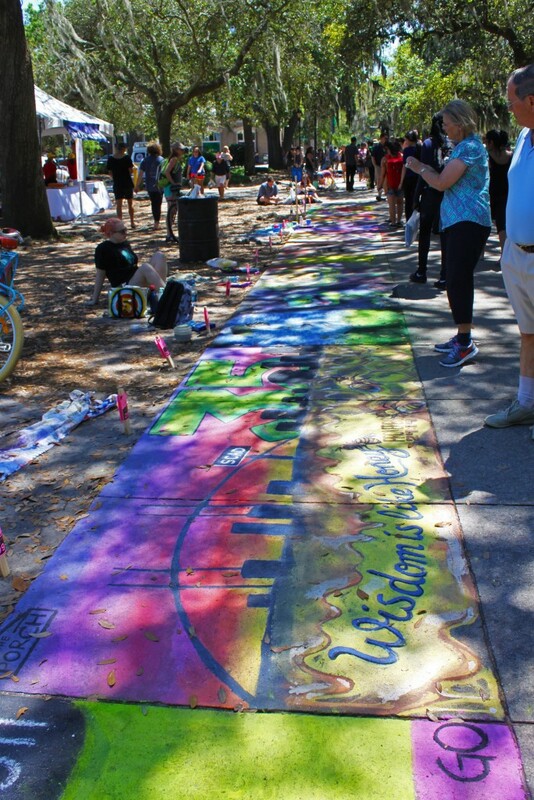 The 34th Annual Sidewalk Arts Festival is located at Forsyth Park, at Drayton Street and East Park Avenue, from 10 a.m. to 4 p.m. on Saturday, April 25. 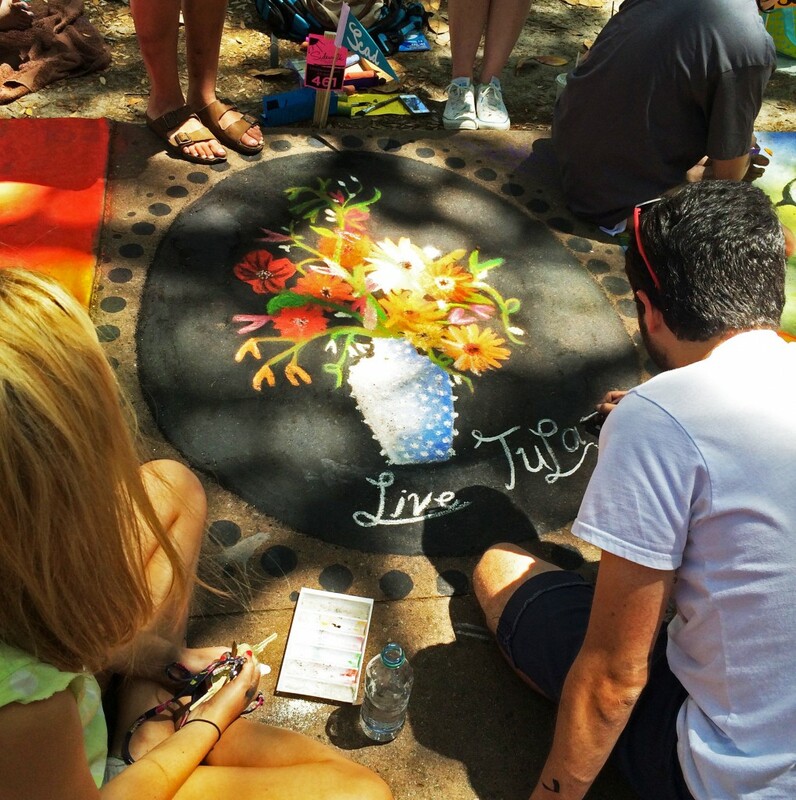 Be sure to share your favorite chalk drawings, or search social media, by using #scadchalk. Photography by John McKinnon, courtesy of SCAD.